A unique riding experience that develops balance and confidence for your child, allowing them to stand out from the crowd! Unirider provides the perfect solution for: day-to-day short trips, walks and/or jogging. Great unisex color - yellow! I will have to make some kind of seatbelt/ harness to keep my grandson (21/2) from jumping off or falling if he forgets and let's go. We've got a 3-year old, and he's at that stage where he wants to walk but runs out of enthusiasm part-way and demands to be carried. So, rather than schlepping everywhere with a massive buggy, this looked like the perfect compromise. And it is! Light and fairly small, you can take it out with you and stick him on it when needed. The bonus being, he LOVES it! It's great fun on top of that wheel; I think largely because it does feel a little less stable than two or four wheels, and that feeling of uncertainty really appeals to a toddler. Plus, I'm sure it gives me a bit of a gentle workout, too! Takes a little effort to manoeuvre it, unless it's flat tarmac. But it does seem very capable off-road. And the bouncier the better, for little Oscar. Great bit of kit. Get one!! And there was no air in Tire so I went to cycling shop to put air into Tire. After 1 day, air goes out again. I tried 2 times but each time the air went off after 1-2 days. It should be initial problem of product. What can I do for this to solve? Same action as a bicycle to fix Tire punk? We have only had the unirider for 3 weeks and my two and half year old absolutely loves it. Only took her a couple of rides for her to gain confidence and balance. Very easy to use, I am now confident enough to hold with just one hand while running. We have taken to the park, off road and to the beach as it handles most terrains well. Postage was really quick and it was very easy to assemble. We are absolutely loving our Unirider! We have a tall 4.5 year old & were a little weary at first that we may not get much use out of it . . . How wrong we were! He loves it. Makes it so much easier (& faster to get around). Also had really fast delivery. Terrific design and easy to use. I brought this a month ago for my 2.4 month old and I am beyond happy I did. It is a amazing product, not only it is easy to use but my daughter loves it. We constantly get looked at or stopped for questions and I can't recommend it enough. When my daughter gives it up my 4yr old son also loves it, easy to use, helps with balance, fun for the kids, we love it. My daughter loves it and is very happy to use it. 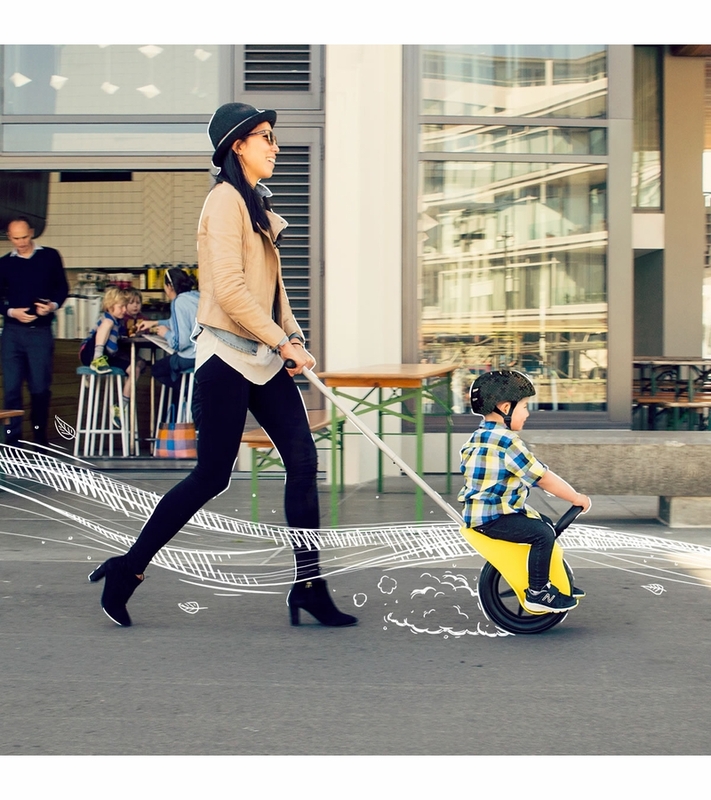 it really is a great solution for toddlers who can't walk too far or if you need to get somewhere quickly. However I have found a few areas that could be improved. - it's not quite as light and easy to use as I hoped. I find it hard to keep her straight and my wrists hurt after a short time. My husband can use it no problem. Neither of us could use it one handed as is suggested. 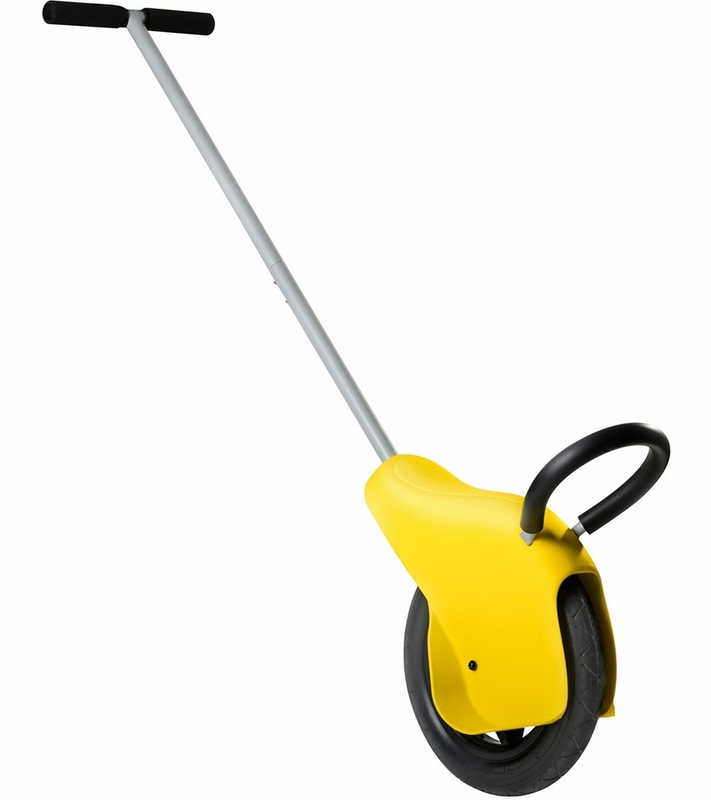 - it's a sturdy piece of kit so if your child decides they want to get off you are lumbered with a big heavy pole to carry and a toddler to manage. - it would be so helpful to have the pole easily retract into its self. - I'm a bit wary leaving it out of view in a busy place. Some inbuilt loop that a bike lock could be secured to would be helpful - as would a way for it to stand securely upright as its a bit of a trip hazard. I bought the unirider as soon as I could, after a chance meeting with a friend of the designer in my home town. It has been brilliant! The first few weeks of using it are a little tense as you get used to it and you take a lot of strain in your wrist, but I can now push it with 1 hand and it's totally relaxed. My son immediately took to it (aged 2 & 3 quarters) and he now leans and steers it and occasionally will lean back, shout "whoo hoo" and lift his legs off and has recently learnt he can let go and still stay upright (so it has been brilliant for his balance and stomach strength). 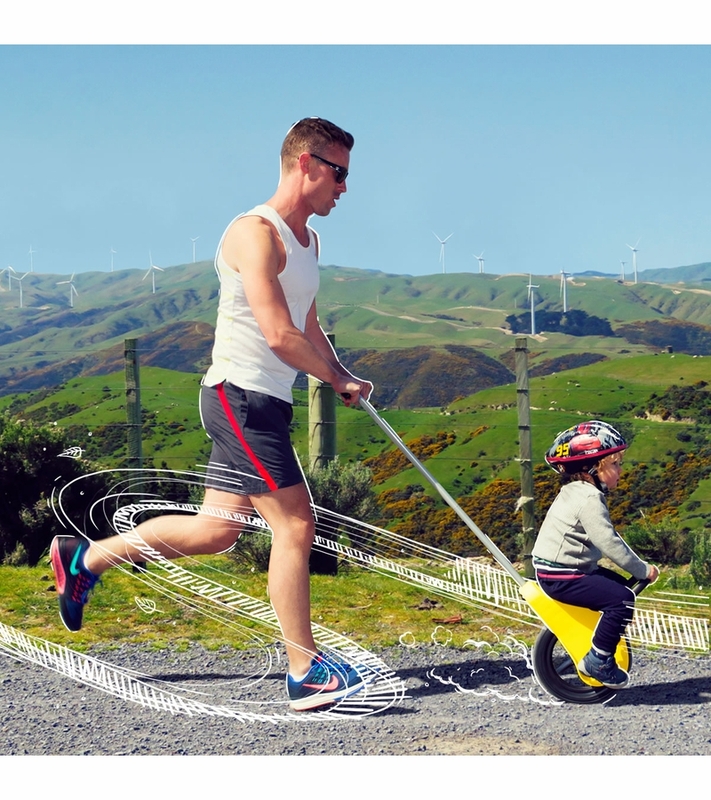 I've let older children on it, aged 5, ride but they do only want to use it as a fun toy or something to ride on whilst being pushed along and chased, but for any child aged 2 or 3, it's a brilliant transportation gadget. Drawbacks: the handle doesn't fold down (although it can be dismantled) and so it won't fit in the boot of a small car unless the seats are down, because of what it us (1 wheel) you can't stand it up and so when you get to the park in super quick time you will have to lie it flat otherwise it will fall down and it's metal and so can cause damage. final drawback is that it's hard to get up a bump or kerb stone more than about 15cm high and you don't realise how many there are until you start using it. You could do a jog/run with this (a helmet definitely would be needed) but be careful if you could hit any small holes or bumps on your route as the child would fly upwards! To end on a positive, as I really do love this product, it has been brilliant - we use it to get to parks, walk around arboretums, run to the sea on the beach (it has been in water too which was fun! ), and generally get from A to B in a fun, quick way and it has helped my nearly 3 year old build up confidence and skills on his balance bike too. We've had it the Unirider for a month and just love it. The wheel does deflate after about 4 weeks but we just reinflate and off we go. Sort of wish it had a kick stand or somethng to help it balance for alighting but all in all its a great purchase and our nearly two year old loves it and can ride for up to 40 mins! We bought this last week and my 3 year old loves it. I thought it may take him a few goes to get his balance, but straight away he was on and off we went. So far we used it around the shopping centre and on the high street, the best part is he can hop on and off, and we're not left pushing around a big empty pram, just holding a reasonably light pole with a wheel. It's fun, it stops him from running off in the shops, and he loves the fact he's not confined to a pram. I will say I find it harder to push than my husband, you have to bear in mind that when their weight shifts to one side or the other, there is nothing but you holding the handle to keep it/your child upright and obviously it's all rather top heavy. However building up a bit of pace does help this. It won't replace our pram totally yet, but great for those short little trips out and about. Instantly became our children's favorite activity! 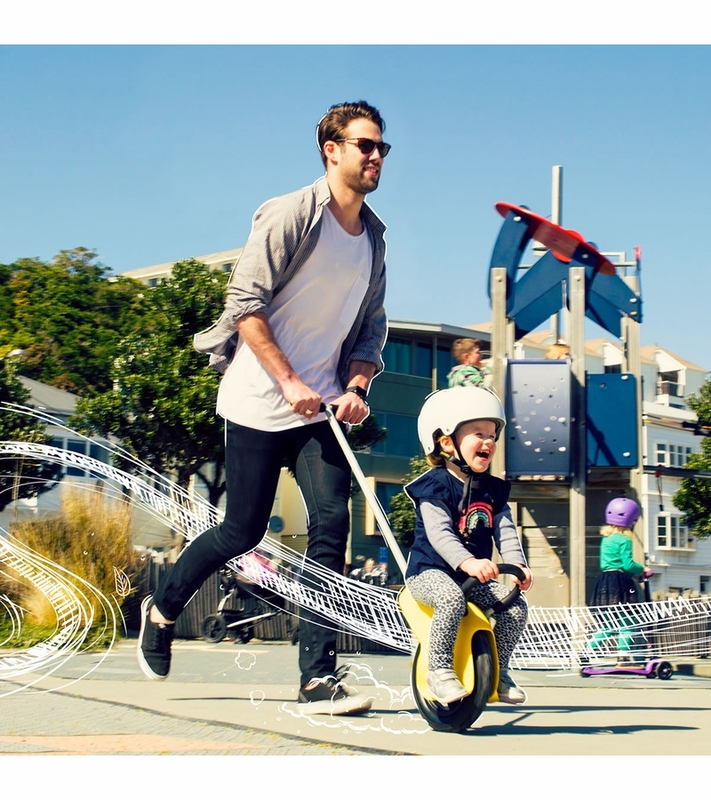 The unirider has surpassed my expectations and it has turned heads in my neighborhood from the moment I took it out of the package and put my son on it for the first time. To put it simply, it's just FUN! We bought it for our two year old but our 4 and 5 year olds have loved riding on it too! It's a breeze to use and it helps your little one work on balance while keeping them involved, because they have to hold on while you push. It has quickly become our children's most favorite activity and they can't wait until their turn. We have had it for a few weeks now and we have used it every day the weather has permitted!! 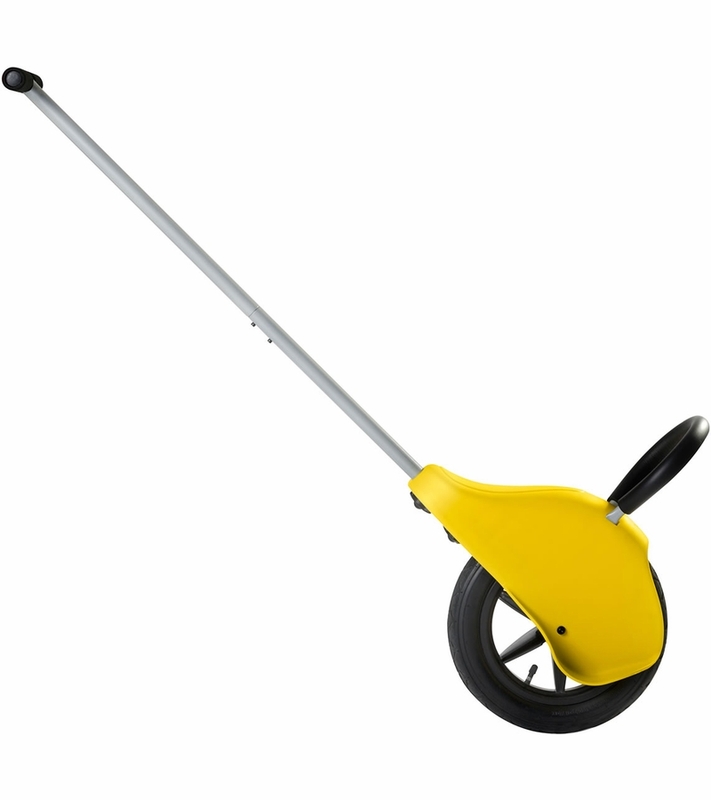 With the rubber wheel it is so easy to go from pavement to grass, gravel, or rocks. It goes over everything so easily! We have absolutely loved having the unirider and I've been stopped multiple times by parents and passerbys asking what it was and where to buy one!! It is so cool!! I thought this was such an ingenious idea and the answer to our challenge where Mr-almost-3 thinks he's too old to go in the pram but cannot walk too far without wanting to be carried. 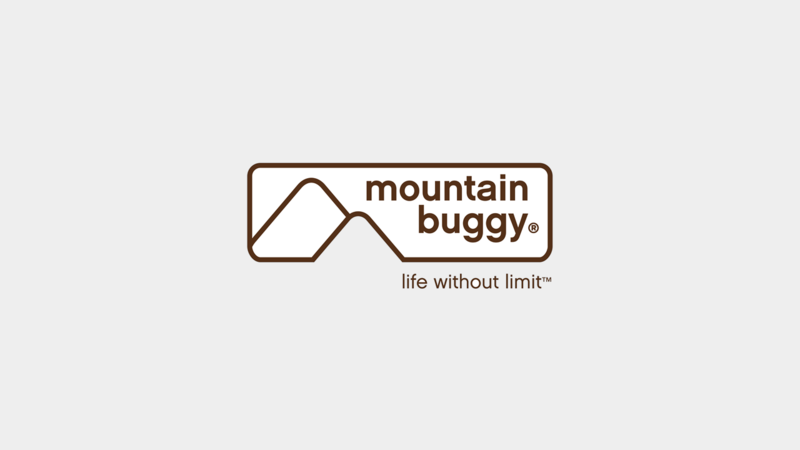 When I read about Mountain Buggy's collaboration with a father to solve this same issue I thought GENIUS! Unfortunately, I have been so disappointed with the product it is now sitting in a cupboard and will unlikely get used. It seems to be more of a novelty toy item rather than a legitimate transportation alternative for a toddler or young child. The child requires substantial balance skills to hover on the front of the bike and the parent bears the brunt of most of their weight. We were able to push our son for roughly 10m before it became too awkward, heavy and unwieldy for my son, my husband or I. Such a shame. May be better for older kids but I can't see you being able to push a child to the shops or around the place on one of these. Maybe as a bit of a fun ride but the marketing and images seem misleading to me. Our 2 year old is absolutely loving the Unirider. Such a fantastic idea and since we've had it we haven't used the buggy! It enables us to go out on longer and more interesting walks as she can easily hop on and off it along the way. Love it! I bought this a month ago and have used it 5 times. During these times I have been stopped more than once by people asking what it is and where to buy one for their children. My 4 year old loves it while I wear my one year old in a carrier. We have walked 2kms using it and hoping my little one will love it just as much as my 4 year old. Bought this after seeing a video of it on a friends FB page. A bit of an impulse buy, but it arrived quickly and was intuitive and simple to assemble. Our little boy took to it immediately and loves it. Now I just need to get fitter to keep up with his demands to go faster ! Kids love it, but it's a pain in my arms! What a fantastic invention and an absolute must have for anyone with a toddler/preschooler/child! Being 5 months pregnant, the Unirider has been a lifesaver enabling me to easy push my 4 year old around instead of having to carry her on long walks when her legs tired. 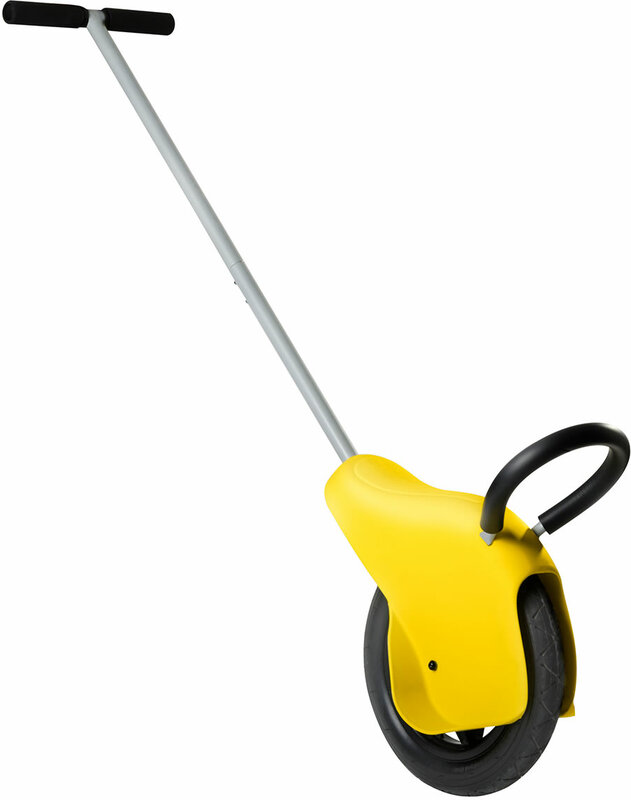 This is such a great product we're really pleased with it. Our daughter got straight on and we were off on the coast path. For two active parents with young children this is a dream come true! Fantastic experience for both child and adult! What a brilliant way to travel around! It has made family walks and trips into town so fun! Highly recommend Unirider as the new way to get about with little people! Love it!